Dutch East India Company (Vereenigde Oostindische Compagnie, VOC 1602-1799), silver rupee, minted for usage in Java Island. However, it must be noted that on the actual coin, no reference to RUPEE but DIRHAM as currency name. Rupiah is much better than the origin suggests with many zeros printed and tacky graphic design paper. The word comes from the Sanskrit Rupiah rupiyah that silver or silver coin means. There circulated ever silver rupees from India in Indonesia when the country was still called the Dutch East Indies and the VOC assume their Asian headquarters, located in "The Castle" in Batavia, ruled the roost. The VOC did business with many parts of Asia, including in the Coromandel and Malabar on the east coast to the west coast of India where they had several factories. In these regions used the VOC local silver coins of good content and attractive design: the Rupees.Other coins were in these areas are not accepted. This rupees were also found attractive in Java, where they could be done with profits of hand by the VOC. The rupee was called by the Dutch ropij and they used Java rupees from various regions of India. The most famous were the Soeratse rupees, beaten to Surat, at that time the most important trading center located in North-West India. The VOC used rupees from further include Sicca, Arcot and Palikate and were knocked these coins even for their own account at various local mints in India. The silver content of the right was claimed for this little bar in 1 kilo from the Netherlands. 1 DIRHAM | DERHAM 1766 175 , Scholten 458 , SSc17 BERNAMA "1 RUPIAH" , TULISAN JAWI / HURUF JAWI: "الي جزيرة جاو الكبير" / "درهم من كمڤني ولندوي" TWISTED / DISTORTED LEGEND: "ILI JAZIRAT JAWA ALKABIR" / "DIRHAM MIN KUMPANI WALANDAWI" , KATA "RUPIAH" TIDAK DITULIS ATAS MATA UANG INI , TAPI UANG LOGAM INI BERNAMA "DIRHAM"
1 DIRHAM | DERHAM 1803 BERNAMA "1 RUPIAH" , TULISAN JAWI / HURUF JAWI: الي جزيرة جاو الكبير" / "درهم من كمڤني ولندوي" TWISTED / DISTORTED LEGEND: "ILI JAZIRAT JAWA ALKABIR" / "DIRHAM MIN KUMPANI WALANDAWI" , KATA "RUPIAH" TIDAK DITULIS ATAS MATA UANG INI , TAPI UANG LOGAM INI BERNAMA "DIRHAM" : "WALANDA" IS "HOLLAND" IN JAVANESE , BUT THE SCRIPT IS JAWI LETTERS , WITHIN A MIXED SENTENCE , INCLUDING "ALWALANDI", MEANING "THE DUTCH" WITH ARABIC "AL" AND "ALKUMPANI" , NOT AND ARAB WORD WITH ARABIC "AL" , "KOMPENI" IN MALAY / INDONESIAN REFFERS TO "VOC". Pelleted-cross also known as Mintmark '9'. Spelling for Jawa could not be confirmed, either with ا as in جاوا or not جاو. Arabic legend with roman numeral: 1766.
a. 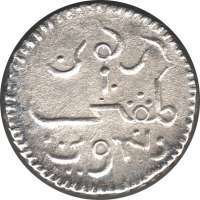 There are three major variations in the Arabic inscriptions on the Rupees issued between 1764 - 1799. The first series was issued between 1764 - 1767. 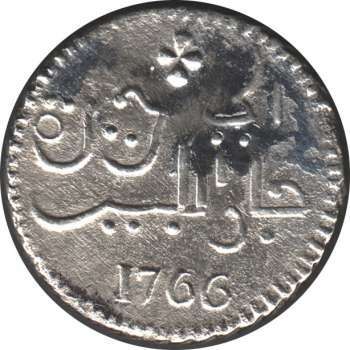 The second series with a slight variation in legend was issued between 1783 - 1799 had a new arrangement of the Arabic inscription. b. The above One Rupee with the year date 1782, 1787 and 1789 have been recorded. However, no known specimens exist.